(10 May - Cropchoice News) -- While environmentalists and consumer groups slug it out with seed and chemical companies, a quieter; but tough GMO battle has been taking shape between testing firms. What approach wins out will have economic impact on producers who face decisions about what kind of testing is best suited for their varieties, farm, market. Twin announcements over the past two weeks have upped the stakes in the GMO testing market. First, at the end of April, DuPont (owner of Pioneer Hi-Bred) announced it would start offering GMO tests. Then, last week, USDA announced GIPSA would review and accredit biotech testing laboratories. DuPont's testing outfit, Qualicon, is a relative latecomer in the commercial test market, which has been dominated by Iowa's Genetic ID and Strategic Diagnostics of Delaware. Genetic ID was first on the market with GMO tests in 1996. Genetic ID's sophisticated tests are geared toward meeting the requirements of international markets - for example, qualifying non-GMO beans for a premium. Genetic ID tests are more expensive and require sending samples to a laboratory. But the company says its highly accurate, quantified results are more than worth the tradeoff of convenience and cost, especially for people with on-farm storage. Starting next year, Genetic ID will certify seed companies selling non-GMO seed. Strategic Diagnostics (SDI) promotes the ease of use of its test kits. With SDI's test, a farmer or elevator can follow directions and get a yes or no answer - shown by what color a paper strip turns - in only a few minutes. The company's website is complete with videos that show how it's done. Like Genetic ID, SDI is active internationally, sending its people and tests to Brazil in recent months. With SDI tests, farmers gain simplicity; but lose the detail that Genetic ID says some markets will demand. The GIPSA initiative is voluntary and intended, according to Ag Secretary Dan Glickman, "to ensure that information is accurate and reliable". It will be based at the GIPSA lab in Kansas City. In effect, the program will provide government validation of the tests on which non-GMO claims are made. The notion is to help make things clearer. 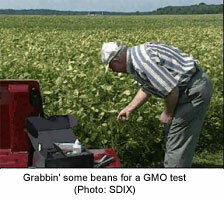 If USDA certifies the reliability of commercial tests, then hopefully marketing will be easier for farmers. But farmers should remember that a validated test doesn't mean a guaranteed market. The GIPSA validation means the test meets manufacturer's specs, not the particular requirements of any food processor or foreign country.